UNESCO, the United Nations Educational, Scientific and Cultural Organization, has been identifying and listing World Heritage Sites of special cultural, scientific and natural importance to humanity for more than thirty years. Today, of the 1,073 sites on the planet, 31 are in the UK including its newest, The English Lake District, added to the list in 2017. They are landscapes, castles, cathedrals, prehistoric communities, bridges, factories and natural wonders. They are scattered across England, Scotland, Wales and Northern Ireland but also Gibraltar and remote island territories in the North and South Atlantic, the Caribbean, and the South Pacific. And a further 11 sites are waiting in the wings in the early stages of nomination to the list. Wherever you travel the UK, plan to include one or two of these remarkable places in your itinerary. This list, in (almost) alphabetical order, includes all the sites in England, Wales and Northern Ireland. And find the World Heritage Sites in Scotland and its islands here. England's newest UNESCO World Heritage Site covers more than 885 square miles of Cumbria in the northwest corner of England, just below the Scottish Border. The region includes more than 50 lakes and mountain tarns as well as England's highest mountain, Scaffell Pike, and three others of more than 3,000 feet. When the railroads arrived in the area in 1840, the Victorians followed and this became the first part of Britain that saw organized touring and vacation travel. Unsuited for most kinds of farming, the Lake District became one of England's primary areas for raising sheep. The needs of sheep and sheep farmers, in turn, shaped the landscape. Among those who sought to retain the Lake District's harmonious way of life was children's author Beatrix Potter, who lived, farmed and wrote here. During her lifetime, she bought up thousands of acres of farms and pastures. When she died, she left them, along with a considerable fortune, to the National Trust. The Lakes and the Lakeland Fells have, over the years, inspired many more authors, from one of the earliest female travel writers and diarists, the intrepid Celia Fiennes in 1698, through a host of Romantic poets—Wordsworth, Samuel Taylor Coleridge and Robert Southey along with their visitors, Shelley, Sir Walter Scott, Nathaniel Hawthorne, Keats, Tennyson and Matthew Arnold. From its 2,000 year old Roman Baths to its Georgian terraces and Pump Room, the entire city of Bath was listed by UNESCO in 1987, one of the earliest world cities to be inscribed on the World Heritage List. 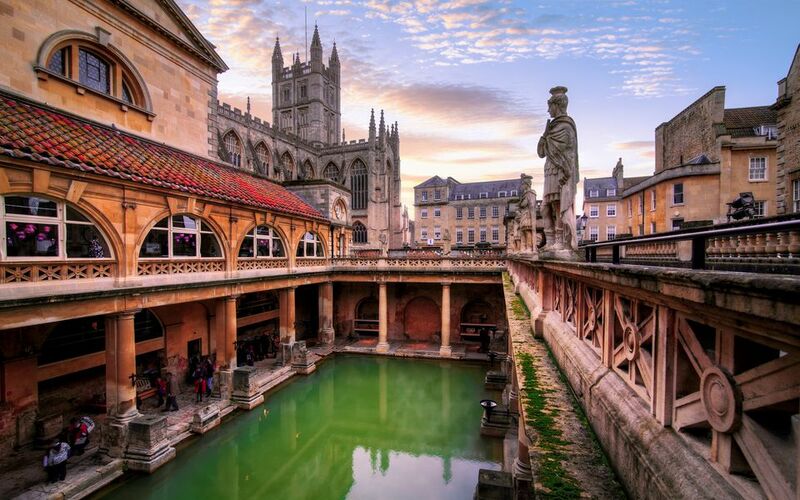 The Roman baths and the temple complex together with the remains of the Roman city, Aquae Sulis, are the most famous and important Roman ruins north of the Alps. They are one of only a small number of Roman bath complexes worldwide actually heated by natural hot springs (the only hot springs in Britain). The Palladian architecture of the 18th century spa town, developed during the reign of George III, incorporates and preserves the Roman site in their layout and design. Jane Austen enjoyed the health giving waters of Bath though she didn't think as much of the accompanying social scene and marriage market as did many of her characters. Besides its feast of historic architecture, Bath has great restaurants, top shopping, quirky museums, a lively cultural scene and brand new in the 21st century, a multi-million pound, thermal spa and a new luxury hotel with the hot spring waters actually pumped into guest rooms. In the 18th and early 19th century, Blaenavon in South Wales was one of the world's largest suppliers of coal and iron manufacture. The iron foundries and the coal mines that originally put Blaenavon on the map still remain. Blaenavon was inscribed on the list in 2000 in recognition of its demonstration of the dynamic forces that shaped the early industrial revolution. Today, visitors can descend deep into the ground at The Big Pit, Wales National Coal Museum,. This was the last deep working coal mine in the area and when it closed in 1980 it ended and era that began with the Blaenavon Iron Works around 1789. The ironworks are considered the best preserved 18th century example in the world. The existing site includes remains of the late 18th and 19th century furnaces, original casting houses and kilns, workers’ housing, a massive chimney,cast-iron pillars and brackets and a water balace tower that demonstrates early life technology using water to counter-balance loads. The nearly 13-square-mile site is laced with self-guided walks across a valley loaded with evidence of early settlement and industry. The only palace not in Royal hands in England, Blenheim Palace was a gift from Queen Anne to John Churchill, the first Duke of Marlborough and ancestor of Winston Churchill—who was born there. The grant was in recognition of his military victory at the Battle of Blenheim. The 18th century house, built between 1705 and 1722 by John Vanbrugh and Nicholas Hawksmoor, is set in a 2,100 acre park, designed by Capability Brown. Among Brown's achievements are lakes and a fabulous cascade that looks like a natural waterfall but it totally down to Brown's skill and artiface. Wander around the park and you might just spot the current Duke, who still occupies part of the house. Considered the "Mother Church" of the Anglican Communion, Canterbury Cathedral dates it's origins to St. Augustine, sent to convert the Britons more than 1400 years ago. The ruins of St. Augustine's Abbey, just outside the city walls, (which you can explore with VR goggles) date from AD 597. The Cathedral is also where St. Thomas à Becket was martyred after a possibly offhand remark by King Henry II. The King and Becket (who was then Archbishop of Canterbury and had been the King's boyhood friend) argued over whether the King's law took precedence over church law. Henry was heard to remark, "Will no one rid me of this troublesome priest" and soon armed knights attacked Becket with swords while he knelt in prayer in the Cathedral. The spot is marked by a candle to this day. Chaucer's pilgrims were headed here in The Canterbury Tales. St Martin's Church, a parish church founded sometime before 597AD, also included in this World Heritage Site, is the oldest church in continuous use in the English speaking world. In addition to the Cathedral and Cathedral Precincts, Canterbury is well located in Kent for visitors to coastal locations such as Whitstable, Chatham and Rochester. If you're a history buff, you'll need to travel around North Wales to see King Edward I's ambitious building program designed to cow the Welsh into recognizing him as their king. Edward I of England led two military campaigns against the Welsh in the late 13th century. Eventually, he surrounded the North Wales province of Gwynedd with castles. These castles and fortified complexes—Beaumaris, Harlech, Caernarvon and Conwy—designed by his architect James of St. George, are considered the finest examples of 13th and 14th century military architecture in Europe. If you've been following the BBC series Poldark, you'll recognize the characteristic engine house of Poldark's ever struggling tin and copper mine, Wheal Leisure. What you may not know is that in the 18th and 19th century, Cornwall and West Devon dominated the world supply of copper and tin. Copper was in demand to clad the hulls of the British Empire's wooden ships; from Napoleonic times onward, tin demand grew for the canning of food. The technology used in this part of southwest Britain led the world. Today, this World Heritage Site, inscribed in 2006, is divided among ten different locations within close proximity of each other, protecting engine houses, beam engines, technology, transportation and communities important to this industry between 1700 and 1914. Paths at Wheal Charlotte, Wheal Coates or Trevellas, in the National Trust site at Chapel Porth. Levant Mine and Beam Engine, St Just. You can also take an underground guided tour at Poldark Mine, the only complete tin mine in Cornwall open to visitors. For good or ill, the factory system was born here when entrepreneur Richard Arkwright adapted and enlarged an earlier invention, the spinning jenny, into the water powered "spinning frame" and created an industry. His invention enabled mass production of strong cotton yarn and Britain's cotton textile production on a world conquering scale was born. Arkwright's 18th century model factories created a template that spread around the world. The mill buildings of New England, especially those beside the river in Lowell, Massachusetts, were influenced and inspired by Arkwright's Derwent Valley factories. Because later development of the factory system moved on to urban settings, several the mills and mill communities here remained relatively unchanged for centuries. The valley of the River Derwent lies near the eastern edge of the Peak District National Park in Derbyshire. Among several historic buildings that can be visited at this World Heritage site, Richard Arkwright's original 1783 cotton mill, Masson Mills, is a highlight. The earlier Cromford Mills nearby, built by Arkwright in 1771, was the world's first successfully water powered cotton mill. You've heard of Jurassic Park no doubt, but did you know that England has a real Jurassic Coast? It's 95 miles of the East Devon and Dorset Coast, in Southwest England. About a third of it is owned and protected by the National Trust. It's composed of wild beaches, sheer white cliffs and stunning rock formations. Important (and easily seen) evidence of the history of life on earth—185 million years of it—is included at this site. A BBC poll choose Durham Cathedral as Britain's best-loved building. Built in the 11th and 12th centuries to house the relics of St. Cuthbert, evangelizer of Northumbria, and historian The Venerable Bede, it has been in continual use and occupation for 1,000 years. The castle, behind it on a peninsula, is an ancient Norman fortress that housed the prince-bishops of Durham. Today it is part of Durham University and, amazingly, you can book a room to stay there. But visits to the Castle are by guided tour only, so check their website to book. This is a multi-national site that reflects the northernmost extent of the Roman Empire in the 2nd century AD. Part of this UNESCO World Heritage inscription stretches across nothern Germany. Hadrian's Wall : As the Roman Empire began to crumble, the Romans built a defensive wall, across the North of Britain, from Carlisle to Newcastle-on-Tyne, with further fortresses on the west stretching south along the Solway Firth. Today, remnants of the wall can be found for about 73 miles. Excavations at Vindolanda, a fort and village on Hadrian's Wall, provide a glimpse into the life of a Roman legion at the edge of the empire. Exhibitions include rare letters home and are among the only examples of Roman handwriting in the world. Hadrian's Wall has been inscribed in the world list since 1987. The Antonine Wall: Twenty years after Hadrian built his wall, in 142 AD, the Emperor Antonius Pius attempted to extend the empire 60 miles further north and built what is now known as the Antonine Wall. Traces of it - some the stone foundations of mile-castles and some little more than ditches or embankments, reach across Scotland from the Firth of Clyde to the Firth of Forth. This evidence of the Roman Frontier was added in 2008. The Giant's Causeway, near Bushmills on the North coast of County Antrim, Northern Ireland, isn't man made. Northern Ireland's only UNESCO World Heritage Site may look like a roadway into the North Atlantic but it is one of Ireland's natural phenomena, made of about 40,000 interlocking, hexagonal basalt columns. They are the remnants of an ancient volcanic lava glow, frozen in time—some more than 12 meters high. The tops of the columns form stepping stones, mostly hexagonal (six-sided) but also with four, five, seven and eight sides, leading from the foot of a cliff into the sea. The Causeway is just part of the Causeway Coast that also includes the terrifying Carrick-a-Rede rope bridge; Northern Ireland's tallest cliff face; Dunseverick Castle, where a waterfall drops straight into the sea; and the haunted ruins of Bonamargy Friary. The visitor's center, opened by the National Trust, brings the science, the history and the great Irish legends and stories associated with the causeway and coast to life. Visitors to Orkney are immediately struck by the enormous concentration of mysterious prehistoric structures that dot the islands. Some are more than 5,000 years old, predating Stonehenge and the Pyramids by several thousand years. The site includes two very different stone circles, The Standing Stones of Stenness and The Ring of Brodgar. There's also a chambered burial mound called Maeshowe, full of Viking runes from a later period, and a 5,000 year old village, Skara Brae, with a number of un-excavated mounds and sites. A huge number of early industries gathered around this strikingly beautiful river gorge in rural Shropshire in the late 18th century. Soon, contemporaries described it as "the most extraordinary district in the world" and "the birthplace of industry." With its 18th century furnaces, factories, workshops and canals, and the world's first iron bridge, the site continues to excite visitors. Famous, of course, for The Beatles, on a more sober note, Liverpool's early fortunes were made in international trade. Its role in the the slave trade makes it a moving and important place to visit for anyone interested in this aspect of history. Liverpool is currently on the "List in Danger" because of controversial developments planned nearby. If you've heard the phrase "Greenwich Mean Time" then you know one of the reasons this ensemble of buildings enclosed in a 17th century park is important. The Royal Observatory engaged in the early astronomical work that made modern navigation possible. Observations by Robert Hooke, and John Flamsteed, the first Astronomer Royal, assured the first accurate measurement of the earth’s movement contributing to accurate global navigation. Today, when you visit the observatory you can straddle 0º longitude and learn about the base-line for the world’s time zone system. Other buildings on the site include the first Palladian building in Britain, the Queen's House, designed by Inigo Jones; the Royal Hospital (now part of the University of Greenwich), a collection of Baroque buildings designed by Christopher Wren and Nicholas Hawksmoor, and parts of Greenwich town center. The Royal Park, popular with visitors and locals and the site of equestrian events in the 2012 Olympics, was designed by André Le Nôtre in 1660. Westminster Abbey is where English monarchs have been hatched, matched and dispatched for nearly 1,000 years. In other words, it has been the location of coronations, royal weddings and royal funerals (though not often burials) for centuries. King Edward the Confessor spent so much time establishing the Abbey that he neglected to have an heir, opening the door to the Norman Conquest. He's buried in the Abbey and his successor, William the Conqueror was crowned here. Next to the Abbey, The Palace of Westminster—called the Mother of Parliaments—is a 19th century gothic revival on the footprint of Edward's original palace—some of which remains deep within the building. And nestled between the two and dwarfed by them, St Margaret's Church was created in the Middle Ages to serve the people of Westminster so they wouldn't disturb the Benedictine monks, who then controlled the Abbey, at their prayers. Together, these three buildings represent nearly about eight centuries of architectural development and the relationship of the monarchy, civil power and the church in forming modern Britain. The virtually unpronounceable (unless you speak Welsh) Pontcysyllte Aqueduct carries the Llangollen Canal across the River Dee at a height of 126 feet. At only 11 feet wide—just about the width of an English narrow boat with inches to spare on either side—this can be a hair-raising 1,007 foot long journey for anyone worried about heights. The canal, used by thousands of narrow boat enthusiasts every year is 204 years old and recognized by UNESCO in June 2009 as the masterpiece of pioneering 17th and 18th century civil engineer Thomas Telford, one of the modern world's earliest and greatest bridge, road and canal builders. In 2012, the Olympic Torch was carried across the canal in a narrow boat on its journey around Britain. Volunteers in Victorian dress towed the boat across. But don't worry. If you decide to do a narrow boat tour on the Llangollen Canal, you can hire a motored boat that crosses at a walking pace. Or join a public cruise across, try a horse-drawn narrow boat or even canoe across. But don't look down. This 300 acre garden on the western edge of London in Kew ( a village of the Royal Borough of Richmond), claims the "largest and most diverse botanical and mycological collections in the world". Started as a Royal garden in 1759 on the site of an earlier exotic garden, it became a national institution in 1840. The site includes 44 listed buildings including several historic, iron framed glasshouses. The gardens hold more than 30,000 living plants as well as at least seven million preserved specimens. In addition to being a worldwide research center for the study of plants, conservation and ecology, Kew also demonstrates garden artistry and design over more than 250 years. Easy to reach by London Underground or bus from Central London, Kew is wonderful to visit at any time of year. Textile mill owner and philanthropist Sir Titus Salt created Saltaire as a complete community for his workers in the 1850s. The village is named for Salt and for the River Aire, in West Yorkshire near Bradford, on which it is located. Mills, the employees' housing, the dining room, Congregational Church, almshouses, hospital, school, institute, and a park all still remain and many are still in use. The World Heritage site demonstrates the emerging paternalistic concern of Victorian employers for social welfare, health and education of their workers. It served as a model for the "garden city" movement in Britain, the USA and elsewhere. No one knows who built Stonehenge, as much as 5,000 years ago, or why they did it, but Britain's most iconic sight has captured the imagination of of visitors for tens of centuries. Nearby Avebury and Silbury Hill are mysteriously spiritual places. Fountains Abbey and Studley Royal Water Garden together make up one of North Yorkshire's most rewarding visitor attractions. Developed over 800 years, it includes a nearly 900-year-old Cistercian abbey—Britain's largest monastic ruin; an 18th century landscaped garden created by a gifted amateur in the era of such celebrity gardeners as Capability Brown and John Vanbrugh; a Jacobean hall and a Victorian Church. William the Conqueror followed his conquest of Britain with a frenzy of castle building. The White Tower, at the center of the fortress now known as the Tower of London, was started almost immediately, in 1066. With it, William the Conqueror baldly demonstrated Norman power and created a fortress and gateway to London at a strategic bend in the River Thames. Today the tower remains a military establishment. It also houses the British Crown Jewels, the Royal Armoury and the world's oldest continuous public exhibitions; The Line of Kings, the world's longest running visitor attraction, opened in 1652. Its display of English Kings in full suits of armor besides full-sized wooden horses was originally created for King Charles II after the Restoration of the Monarchy. It has been on continuous exhibition and popular ever since.